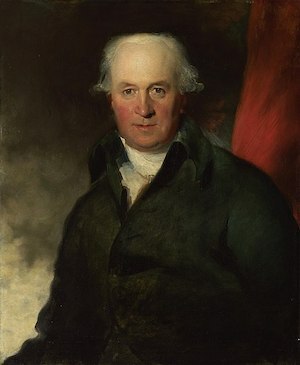 Thomas Lawrence, Senior: Sir Thomas’s father and lifelong mentor. Innkeeper of the Black Bear, Devizes in Wiltshire; later living in Bath and London. Lucy Lawrence, née Hill: Sir Thomas’s mother. Sarah Siddons: leading actress in Bath and at Drury Lane Theatre, London. Lifelong friend of Lawrence. Sally Siddons: Sarah’s eldest daughter and Lawrence’s love. 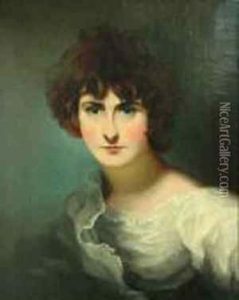 Maria Siddons:Sarah’s second daughter, Sally’s rival for Lawrence. 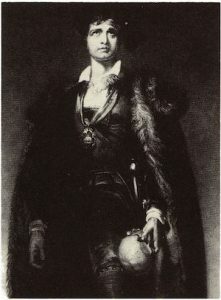 John Philip Kemble: Sarah’s brother, actor and friend to Lawrence. William Siddons: Sarah’s husband and manager. David Garrick by Thomas Gainsborough (from Wikipedia). 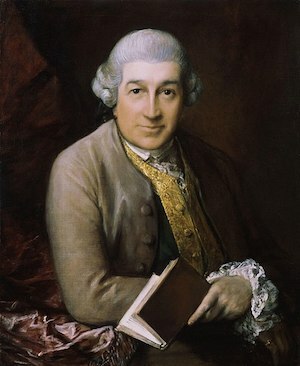 David Garrick: Director, producer and leading actor at Drury Lane Theatre. Frequent visitor to the Black Bear Inn. Gentleman John Jackson: one-time Bare-knuckle Boxing Champion of England, owner of famous Bond Street gym. Friend of Sir Thomas. William Hoare and Prince Hoare: father and son, sponsors of young Thomas. Francis Burdett and George Canning: contemporaries of Thomas, regular visitors to Bath. Whether the youthful Thomas met or made friends with them there is debatable. Both became prominent Members of Parliament, Canning Prime Minister. The Duchess of Devonshire: another contemporary, born Lady Georgiana Spencer, daughter of the Earl of Spencer and great-great-great-great-aunt of Diana, Princess of Wales. Flamboyant London socialite. John Julius Angerstein: Russian born London banker, close friend and adviser to Thomas. John and Amelia Angerstein: son of John Julius and daughter of Joseph Lock, married 1799; close contemporary friends of Thomas. 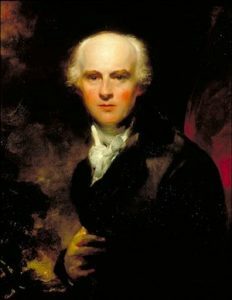 William Hamilton (1): artist known for historical and burlesque subjects in modern Italian style. 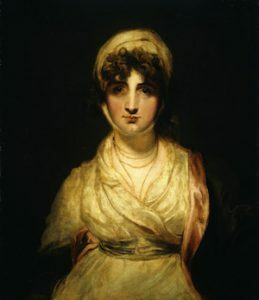 Not recognised as a painter of portraits except for a few of Sarah Siddons. Sponsor of young Thomas who remained long term friend with his family. William Hamilton (2): an English diplomat who married the notorious Emma Hart, later mistress of Lord Nelson. 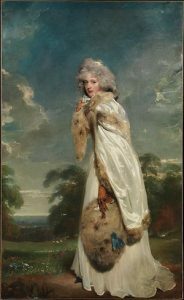 Mrs Pennington, formerly Compton: the wife of John Pennington MP, who became the first Lord Muncaster. She was what would be called nowadays a celebrity, best known for her ‘Intimate Correspondence’ with Heather Piozzi. 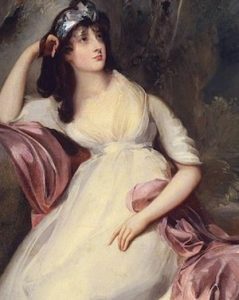 Elizabeth Croft: one of few names linked to Sir Thomas, usually platonically, after the death of Sally. 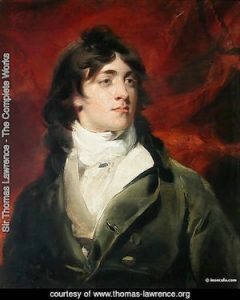 Author of Recollections of Sir Thomas Lawrence, PRA, during an intimacy of nearly thirty years. Sister of Sir Richard Croft, obstetrician to Princess Charlotte, only child of George IV. John Philpott Curran: Irish MP, challenging portrait subject. Joseph Farington: diarist, friend and mentor to Lawrence. Samuel Lysons: FRS, antiquarian and lifelong friend.